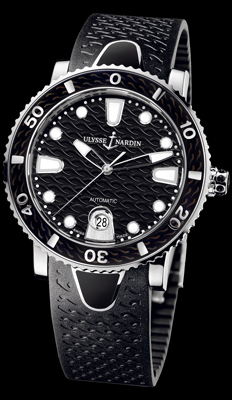 40mm, stainless steel case, automatic movement, date, the dial is etched with black waves, exhibition case back reveals the Ulysse Nardin name and anchor logo etched on the rotor. It is available on a black rubber strap with folding buckle. Es caja de acero, 40mm, con fechador, y mecanismo automatico. Presenta el respaldo cristal zafiro transparente, el rotor viene gravado con el nombre de Ulysse Nardin y logo de ancla. Disponible en cinta de caucho con broche doble.